I've been up to my earballs in work this week. I still enjoy the occasional crunch mode; for one thing, I'm always extremely sure about what I should be working on. But it does mean that other interesting work—like, oh, say, Friday words—gets relegated to the few gaps in the schedule. For new-to-me words this week, I have the term smishing, which I learned on Twitter from John Espirian. Smishing is like phishing—trying to get you to reveal personal info or to download malware—but using text messages. Like, you get a text message saying "We will charge you $10 unless you cancel the order. Go to [badwebsite.com]." Panic! Tap! Pwned. The origin of the word might not be obvious unless you know that the texting facility of your phone is more formally known as SMS, for Short Message Service. So smishing is actually SMS + phishing and was originally spelled "SMiShing." An article says that the term was invented by researchers at McAfee Avert Labs. It looks like the word was invented in 2012. When John posted on Twitter about it, he was talking about a notification that he got from his bank about smishing. I know I'm behind the curve on new terminology when I'm learning it from a bank, dang. An unexpected etymology came my way this week when I was reading the book The Big Necessity: The Unmentionable World of Human Waste and Why It Matters. I think it was Stan Carey, editor and contributor to the Strong Language blog (NSFW, right? ), who posted about it. Quiz yourself: where does the word sewer come from? The unexpected part was how the word got into French. Here's Rose George, the author of the aforementioned book: "Somehow, in a way obvious only to etymologists, seuwire in turn derived from the Latin ex [out of] and aqua [water]." I'm not convinced it's particularly obvious to etymologists, either. But anyway, there you go: sewer is "Out, damned water!" 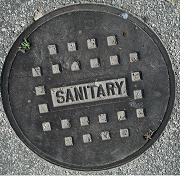 The modern sense of sewer specifically for wastewater arises in the 1600s. And very shortly thereafter we already find it being used metaphorically as "dumping ground." Incidentally, read the book. It will change your thinking about things you probably try hard not to think about. "Short" meant 160 characters; this length limitation is where the original 140-character limit came from in Twitter. Ha, remember when we used to worry about long-distance charges?